Lost at home to Dynamic Togolais 10th and Tractor Club 1st also a draw at away to US Bitam 15th, sounds bad enough for last 3 games got us down to 4th! FC Kallon outclassed Al Karamah and beat them 2 - 0 in their Division 5 fixture. Díaz scored a goal and was later voted Man of the Match for his performance. Onomah was also on the scoresheet for his side. Remembered to freshen things up this time and got a much needed three points. We're now 9th and 4 points from the playoffs with 9 games left to play. FC Kallon slumped to a 3 - 1 defeat to Isidro Metapán in their Division 5 fixture. Brewster was on the scoresheet for his side. A poor result for us, which leaves us 5 points from the playoffs with 8 games left. Shamrock Rovers slumped to a 1 - 0 defeat against Tractor Club in their Division 5 fixture. A bit of a surprise as we put up more of a match than anticipated as the squad starts to get revamped. FC Kallon slumped to a 1 - 0 defeat against AS Kaloum Star in their Division 5 fixture. Not sure what's happened to us after we'd built up some momentum midway through the season. My U21's squad clearly aren't ready for the step up just yet. Shamrock Rovers outclassed FC Kallon and beat them 2 - 0 in their Division 5 fixture. García and Fletcher, in his lat match for the club, were amongst the goalscorers. Yep, proof even more so that our season is firmly written off! Shamrock Rovers were unable to take their chances against Lokomotiv Tashkent and lost 2 - 1 in their Division 5 fixture. Kenedy scored the only goal for Shamrock Rovers and was later voted Man of the Match for his performance. That about sums it up, but we will be weaker in upcoming matches as we let some of the big earners go. FC Kallon beat Deportivo Táchira 2 - 1 in their Division 5 fixture. Dahlberg had an impressive game and was voted Man of the Match. Díaz and Brewster were amongst the goalscorers. A thrilling match ended 3 - 3 between Shamrock Rovers and OFK Titograd Podgorica in their Division 5 encounter. García, Benayoun and Romero were amongst the goalscorers. A good result for Rovers. Titograd looked stronger than us, but we managed to get three goals, the last was scored late & nabbed us a point thanks to the legend that is Benayoun! FC Kallon beat NSÍ Runavík 4 - 1 in their Division 5 fixture. Onomah scored a goal and was later voted Man of the Match for his performance. Díaz and Brewster were also amongst the goalscorers. Decent win though I think the season remains a writeoff, despite being 9 points behind the playoffs with 4 games left. Shamrock Rovers beat CSD Municipal 2 - 0 in their Division 5 fixture. Radu had an impressive game and was voted Man of the Match. Ganago and Kenedy were amongst the goalscorers. Another surprising victory for the Hoops. Our keeper was awarded man of the match yet we had 17 shots, 8 on target, to the hosts having 13, & 2 on target. Make of that what you will! The match ended 0 - 0 between FC Kallon and Dynamic Togolais in their Division 5 fixture. Shamrock Rovers beat Saham SC 3 - 0 in their Division 5 fixture. Hleb, Ganago and Adams were amongst the goalscorers. Saham's keeper picked up the MOM award which is a fair reflection of how the match played out. FC Kallon slumped to a 2 - 0 defeat to US Bitam in their Division 5 fixture. And that is that, though it was unlikely, we cannot get to the playoffs for sure now. FC Kallon beat Tractor Club 2 - 1 in their Division 5 fixture. Onyekuru scored a goal and was later voted Man of the Match for his performance. Feeney was also on the scoresheet for his side. Confirmation that we will definitely finish 9th this season with one game left. Shamrock Rovers beat Foullah Edifice 3 - 0 in their Division 5 fixture. Traoré scored a goal and was later voted Man of the Match for his performance. Hleb and García were also amongst the goalscorers. Another good win as we finish the season with better than anticipated results. The rebuilding of the squad continues. We are 7th, can't finish any higher, but could drop a place with one fixture remaining this season. FC Kallon slumped to a 1 - 0 defeat to Ferroviario de Maputo in their Division 5 fixture. Finished 9th, awarded £1,559,077 in prize money. Shamrock Rovers outclassed Managua FC and beat them 1 - 0 in their Division 5 fixture. Joaquín scored the winner for Shamrock Rovers and was later voted Man of the Match for his performance. The Hoops finish 7th & are awarded £1,842,545 in prize money. Time to start investing! We've also set a new record for the club going 4 matches unbeaten for the first time. Isidro Metapán finished season 3rd (85 points) just 1 point behind Bolivar 2nd (86 points) team! awarded £ 2,409,482 prize mney. That was bad luck of us when we had a draw with Saham SC 16th (0-0) at home! 15 shots but couldn't score blah.. 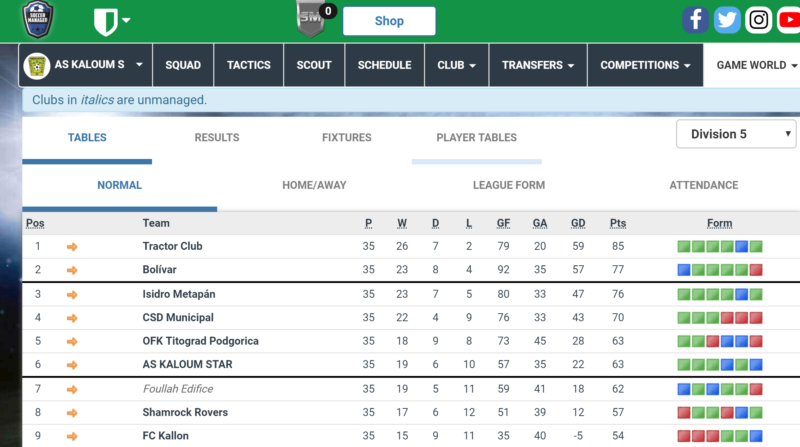 Play off semi final will be with Mladost Podgorica 6th (69 points)..
AS Kaloum Star outclassed Enyimba and beat them 3 - 0 in their Division 5 fixture. Hilton scored a goal and was later voted Man of the Match for his performance. Robben and Rueda were also amongst the goalscorers. Great win, and with that we push into 5th and onto the playoffs! Mark - I'm assuming it's intentional that everyone (bar one) is under 21?